Note: Weight on the Power Clean is 135lb. for men and 95lb. for women. Scaled weights and modifications will be prescribed in the gym. Box jump height is 24 inches for men and 20 inches for women. Each class will begin with a review of the Power Clean technique. Be sure to attend the CrossFit Amundson Mobility Class (Yoga!) tonight at the Krav Maga gym from 6:00 to 7:00 PM. 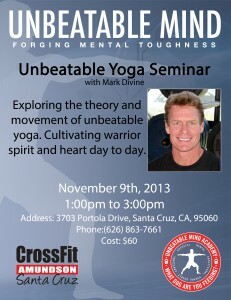 Warrior Yoga Seminar – Sign up at the gym! 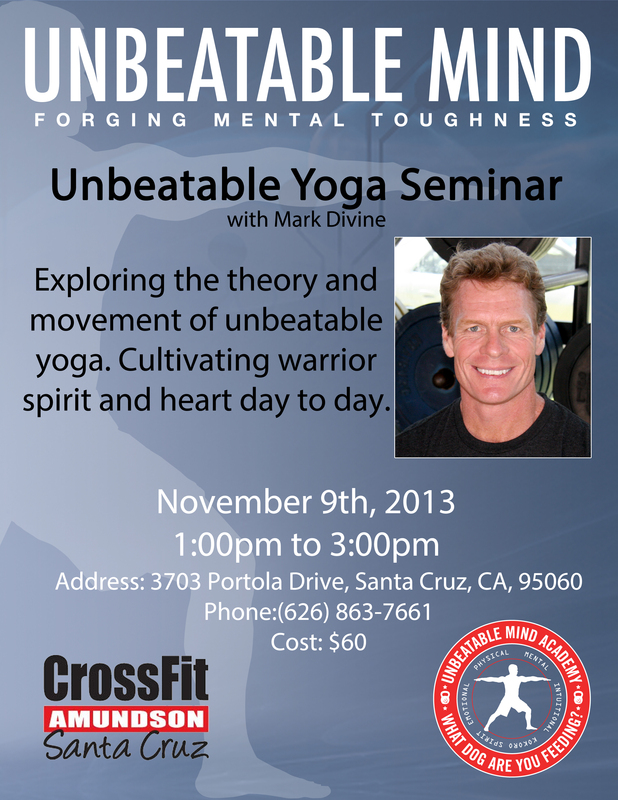 Our good friend Mark Divine, founder of SEALFIT and the legendary Kokoro Camp, is returning to our gym on November 9, 2013, for a Warrior Yoga and Unbeatable Mind Seminar. This is an incredible opportunity to learn from a true warrior. This seminar is FREE for CrossFit Amundson Athletes. Sign up early at the gym! When are you going to record the seminar, or better yet live-stream it? Mark and Greg, I created a process that people can use to identify their own personal patterns for quitting. Once identified a person can choose a new approach to quitting. People can use this to keep going, ie a 100 mile run, WOD, etc., or deliberately quit, ie smoking. It gives people control and intelligence of the process. I’d like to share it both of you and through the 2 of you the greater CF Community.